The following is a list of cooperative research projects, which have been adapted by MEXT, University, etc. 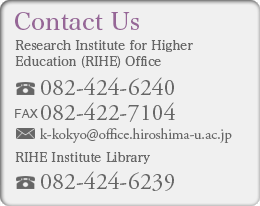 We are promoting various kinds of cooperative research in collaboration with domestic and international researchers as well as faculty at Hiroshima University. and another 19 cooperative research projects.